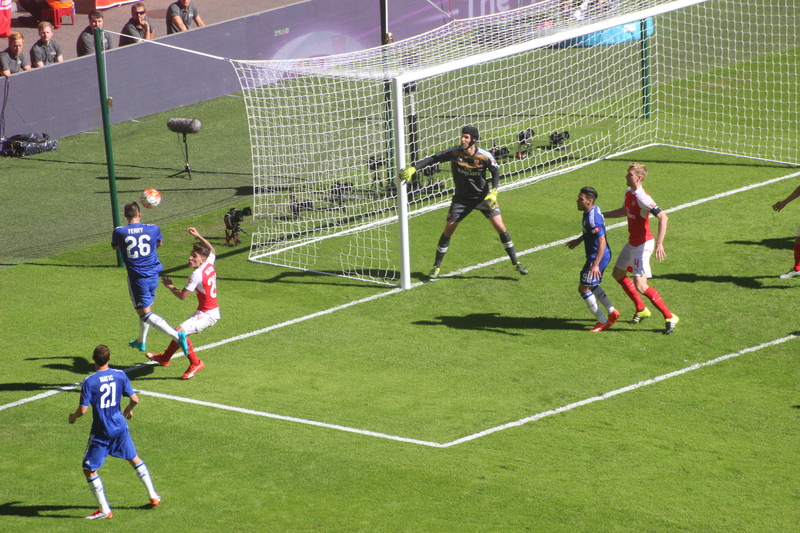 Chelsea vs. Arsenal : 2 August 2015. For the Football Association’s season opener this certainly seems to be the case. Long gone are the days when a trip to Wembley Stadium elicited a warm glow for myself and thousands like me. We are, as another old saying goes, a victim of our success. This would be Chelsea’s ninth such game – Charity Shield, then Community Shield – since 1997, and our eleventh in total. The 1955 game (beating Newcastle United at Stamford Bridge in front of just 12,802) is hardly ever spoken about. The 1970 game (losing to Everton at home, with a gate of 43,547, and Stamford Bridge never looking more sun-kissed) is on the outer reaches of modern Chelsea fans’ awareness. From 1997 though, our appearance in this game – first as F.A. Cup winners and then, get used to it world, as league champions – has been a regular event. However, as of 2015, it is the one game every season that is starting to pall. With the summer trip to the United States behind me, and with the league opener against Swansea City not far away, I was trying my hardest to get “up” for our Community Shield game against Arsenal. Of course it would be great to see a few Chelsea mates for the first time of the summer, but as for the game itself, I was struggling. There seemed to be a common understanding among fellow fans that a game against local rivals would add a little excitement to the game. There was talk of a “mark” being set for the season. There was also to be the strange sight of Petr Cech in Arsenal colours. Despite all of this, I was still having difficulties. It was almost as if I was travelling to Wembley under some sort of strange sense of duty, which sounds rather pompous and silly. But, by the same token, there was no chance of me ever missing it. I collected His Lordship at 9.30am. The domestic season was up and running. As we rose steadily on the elevated section of the M4, I glanced north and spotted the Wembley arch, clearly visible and with the late morning sun picking it out perfectly against the blue North London sky. We were soon parked at Barons Court. At about 12.30pm we met up with Alan, Gary, John and Dave at The Tyburn near Marble Arch. The last time that I was in this pub, and my last visit to Wembley in March, I was in my own little world of sadness. As I sipped on a pint of San Miguel, I genuinely felt that a new season would help me move on from the grief which took over the closing months of 2014-2015. Alan and Gary left for the game at about 1.45pm. Dave, Parky and myself stayed on for – you have guessed it – “one last beer.” We then had to hotfoot it to Marylebone to catch the 2.28pm train. It would be a fight to make kick-off. We never learn, do we? We bumped into the rumbustious crew from Trowbridge and Westbury on the fifteen minute train journey – “Parky!” – and it was great to see them again. To be honest, they would be the only familiar faces that we would see all afternoon. Maybe others were finding it hard to get “up” for this game too. Inside the stadium concourse, I spotted Alan and Gary behind me. We reached our seats just as the game kicked-off. With people still lining up for beers in the area outside, the stadium was not remotely full at the start. However, after ten minutes, things were looking better and seats were filling up. It was obvious, though, that there were more empty red seats in our western end than in the Arsenal end. It was also noticeable that the Arsenal supporters in the lower tier were standing, whereas Chelsea were sitting. As an indicator of which set of fans were more “up” for the game, Chelsea were coming in a poor second. It was immediately disconcerting to see Petr Cech in the monstrosity of an Arsenal kit. Wembley Stadium was bathed in sunlight, with its huge and cumbersome roof supports causing strong shadows. It is a huge stadium, but I am still finding it a difficult stadium to admire. I still can’t believe that such a complex array of under structure does not support a sliding roof. It is a little ironic that the designing and building process for the new stadium – which took seven long years to be completed – was headed from 1997 to 2001 by none other than Ken Bates. That Chelsea Football Club might be moving in to Wembley for three years while Bates’ “Chelsea Village” is razed to the ground is doubly ironic. There were few Chelsea banners on show. One Arsenal banner caught my eye. The standard “Believe” had a yellow ribbon tied around the “I” which alludes to their bespoke F.A. Cup Final song. Quite clever. I thought Chelsea began reasonably well, but then played second fiddle to a more energised and incisive Arsenal team for most of the first-half. I looked over at the Arsenal team which flashed up on the scoreboard. I must have reached that part of my Chelsea Life-Cycle which results in me being increasingly indifferent to players on opposing teams. In an identity parade, I would be hard-pressed to name Monreal, Bellerin and Coquelin. It’s all about Chowlsea these days. As I watched play develop before me, with Walcott finding Oxlade-Chamberlain, there was a clear moment when Dave saw enough of the ball to make a clearing tackle. That crucial moment passed and the Arsenal player struck an unstoppable riser past Courtois into the net. The Arsenal thousands roared, while we sat silently. We did our best to get the singing going, but our section was unsurprisingly docile. It was typical that while we clapped and applauded Petr Cech – though not ridiculously so – Cesc Fabregas was booed by his former Arsenal family every time he touched the ball. We found it difficult to get our game going in the first-half. To be fair, Willian was our main threat, moving well and more inclined to attack directly than in the past. I lost count of the times Ivanovic failed to deliver a cross by hitting the outstretched leg of his full back. Two chances fell to Ramires. A shot went narrowly wide, but then a more glaring error. With the goal at his mercy, he headed over from a Remy cross. To be truthful, the ball was slightly too high for him. Or maybe he jumped too soon. It was a clear chance though. Elsewhere we struggled. A goal-line clearance from Ivanovic, with archetypal Goon Mertesacker breathing down his neck, stopped a second goal. We hoped for a masterful Mourinho tongue-lashing at the break. He replaced Loic Remy with Radamel Falcao. We hoped for good things. Oscar soon replaced Ramires, and I immediately noted a bigger desire from him to attack the defensive lines. On a couple of occasions, he drifted inside and past his markers with ease. More of the same this season please. On the hour, a second glaring miss of the match. Fabregas played in Eden Hazard, our player of the moment, and we fully expected him to rifle a shot low past Cech. Instead, his shot immediately rose high and flew over the crossbar. Such a rare piece of shoddy finishing from Eden shocked us all. A free-kick from Oscar – one of many which we were awarded in the final quarter – forced a save from Cech in the Arsenal goal. It probably looked more difficult than it was. The Arsenal thousands roared. Kurt Zouma replaced Dave at left-back. That surprised me. On the other flank, Ivanovic was continuing to flounder. As the game progressed, we never really looked like equalising. The atmosphere was deadening, though few Chelsea fans had decided to leave, which was a good sign. Victor Moses replaced Terry, and Mourinho re-jigged things. Moses’ pace was not utilised and the equaliser proved elusive. Falcao had chased a few scraps, but his service was not great. In the closing minutes, Arsenal had a couple of chances to increase their lead. To be truthful, it hadn’t been a very entertaining match. We had looked a little sluggish, with our key players unable to match the creativity in key areas shown by Arsenal. At the final whistle, the Arsenal fans feverishly waved their red and white flags as if they had won a cup final. Yes, I know, I sound bitter don’t I? I was well aware that this reaction would be typical of the Chelsea supporters. A win, and an important marker for the season ahead in a vital showcase game. A loss, and an irrelevant result in little more than a friendly. At the queue for the train back to Marylebone, there was a little chat among a few of us about the possibility of Chelsea using Wembley as a temporary home for several seasons should our planning application for the complete overhaul of our stadium be accepted. For some, Wembley would be a preferred option. For me, coming to London from the south-west, I think I would prefer to use Twickenham. Wembley, in my opinion, should not be used for club games, though you can be very sure that the Football Association would readily accept Roman’s millions for three seasons. It would also, perhaps forever, take away what remaining buzz of excitement that I get from visiting Wembley with Chelsea, if we were to play eighty games there in three years. There are also logistical problems getting in and out of central London. It would extend my day by an extra hour at least. The atmosphere isn’t great at Wembley. How would it cope with 50,000 Chelsea fans? I am not sure. Would we be able to get it jumping? It would be tough. There is also the painful sight of Chelsea playing home games in a stadium of 90,000 red seats. Ken – could you not have chosen a more neutral colour? To be fair, despite my moans about added travel time, we were back at Barons Court by 6.30pm. On the way home, I glanced north once more. The Wembley arch was only just visible now, barely distinguishable against the early evening cloud. This entry was posted in Season 2015-2016 and tagged 2015-2016, Arsenal, Atmosphere, Community Shield, Eden Hazard, Ken Bates, London, Roman Abramovich, Stadia, Stamford Bridge, Summer Tour, USA, Wembley by Chris Axon. Bookmark the permalink.